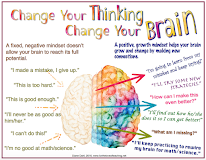 If your district recently adopted Everyday Math, you’re a couple months into the school year now and perhaps beginning to get into the swing of things. 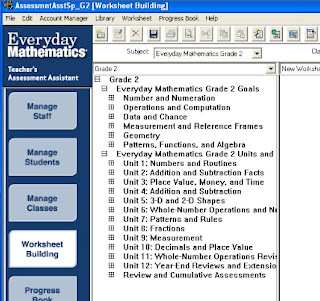 You may have wondered about the Teachers Assessment Assistant CD that has been gamely peeking at you from your Teachers kit. Perhaps you’ve even popped it into the computer for a look-see, then immediately tucked it away again discreetly promising yourself to look again when you have more time. Time… what’s that? The aforementioned CD comes with the Everyday Math Teacher’s Kit. For installation, simply follow the directions inside the CD cover. Username and password are both admin. 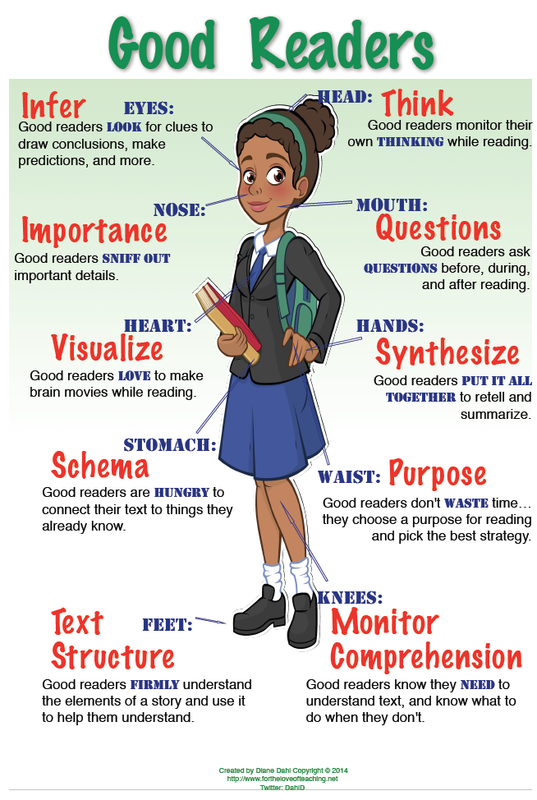 I get the most questions about the worksheet builder; therefore I’m going to focus on that in this post. After signing in, select Worksheet Building on the home screen (figure 1). 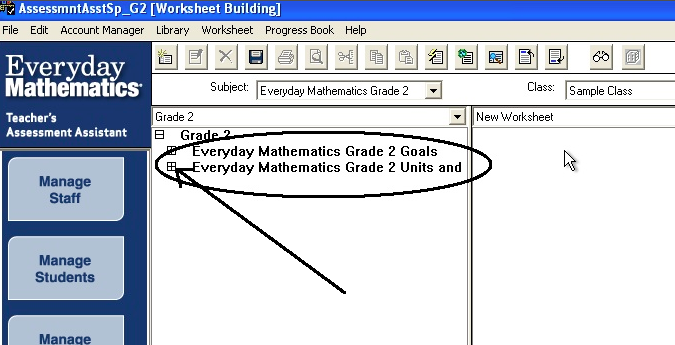 On the next screen you will have the option of selecting questions for your worksheet by goal or by unit. Click the boxes at the left of those options to see more (see figure 2). In figure 3 you can see the selections available under goals and units. For my example, I’m going to use the unit section. Select the box beside the desired unit. 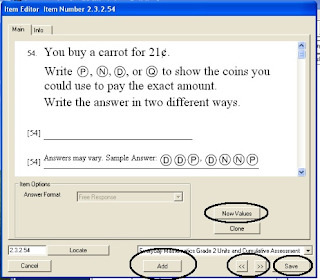 After clicking the box, three options appear: oral assessment, written assessment, and open response (figure 4). Again, select the box beside the option you want. 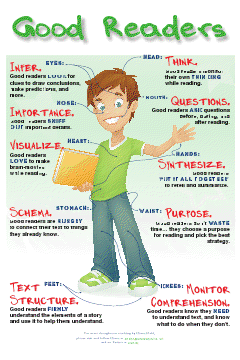 In figure 4, I selected written assessment. A list of objectives appears. As you can see in figure 5, there are only numbers of objectives listed… no descriptions. 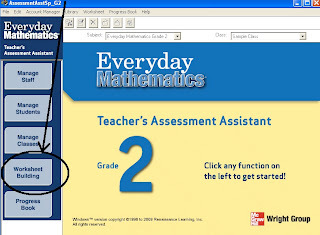 I am unable to find corresponding numbers in the Teachers Lesson Guide. The numbers might be there; but your friendly neighborhood blogger here can’t find them. Fortunately there are fantastic (not to mention preferable) ways around it. One way is to double click an objective. I’ll double click the first one labeled [2.3.2.54]. The popup in figure 6 will appear. If you decide to add this question to your worksheet, select the Add button. To make a new question on the SAME objective, select the New Values button. 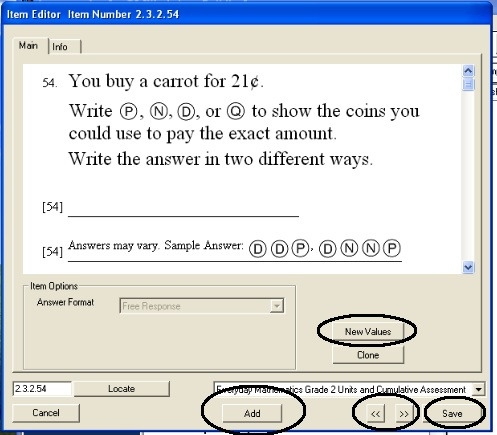 Select Add to add the question to your worksheet. Do not select Save until you are finished adding questions. To see the problems for the next or previous objective, select the arrows at the bottom of the window. When you have finished choosing the problems for your worksheet, select the Save button. You will now see the objectives you selected in the New Worksheet window (figure 7). Another option to view questions within an objective is to single click the objective you want to see, and then click the button with eyeglasses (see figure 8) on the toolbar. This will work on either side of the active window shown below. 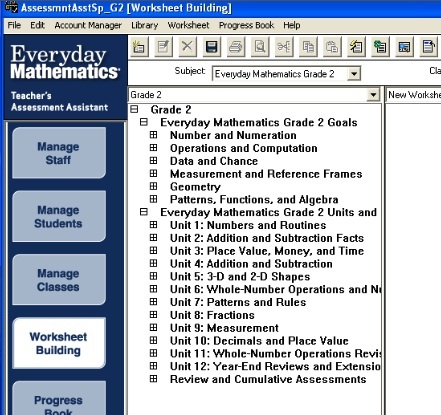 The New Worksheet side will show ALL the math problems already on your worksheet. 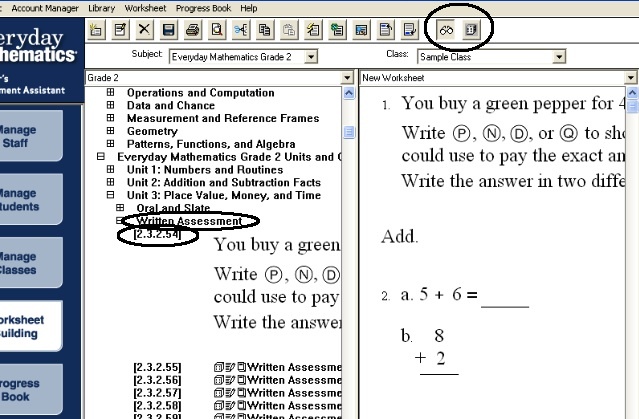 To create a different or new math question within an objective, select the dice button on the toolbar (figure 8). 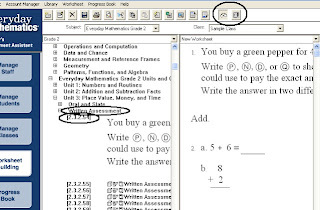 The left side window will only show an individual math problem for a selected objective unless you select the entire chapter. 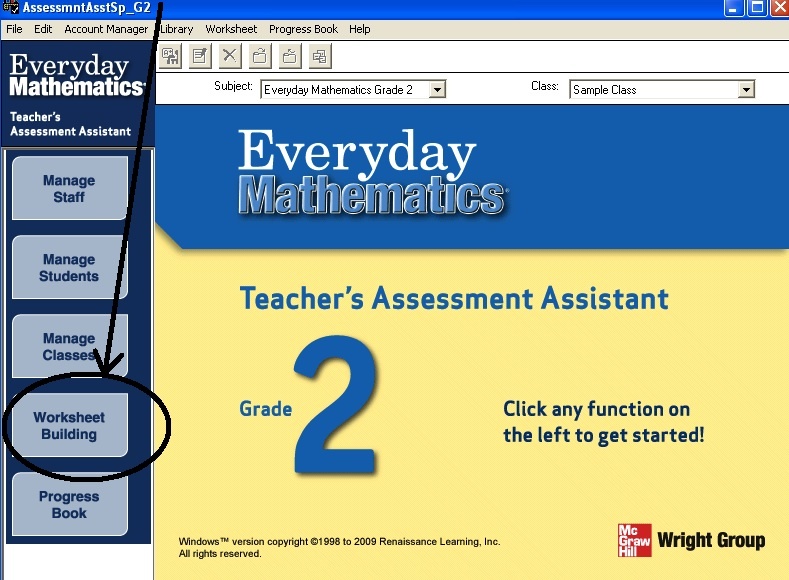 To select the chapter, select Written Assessment (circled in figure 8) and then click the eyeglass button. The math problems will appear below each objective. (Note: you have to de-select the eyeglass button to make the questions disappear again.) To change a problem within an objective, select the dice button on the toolbar (next to the eyeglass button). 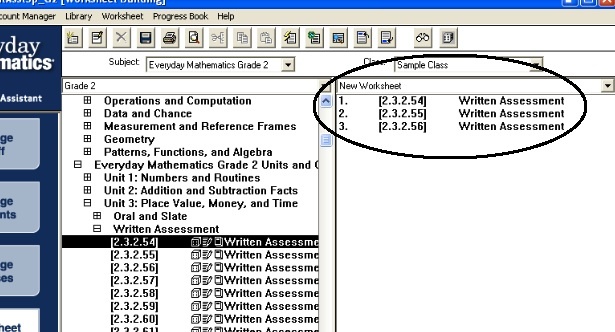 On this screen you can also drag an objective from the left window into the worksheet window. 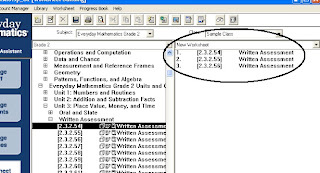 The last option to create a worksheet is to use the Worksheet Wizard. However, as far as I can tell you cannot easily choose your own math problems with this option. However, I do recommend playing around with it as it may suit your needs. Should you choose to use it, select the button on the toolbar with a lightning bolt and follow prompts. Finally, save the worksheet by selecting the save button or select file/save. A window will appear giving you the opportunity to name and save the worksheet. 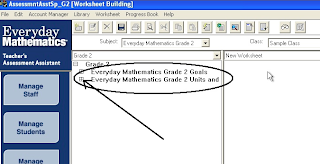 Now the worksheet will be available from the dropdown box at the top of the worksheet window. You are able to print at any point. 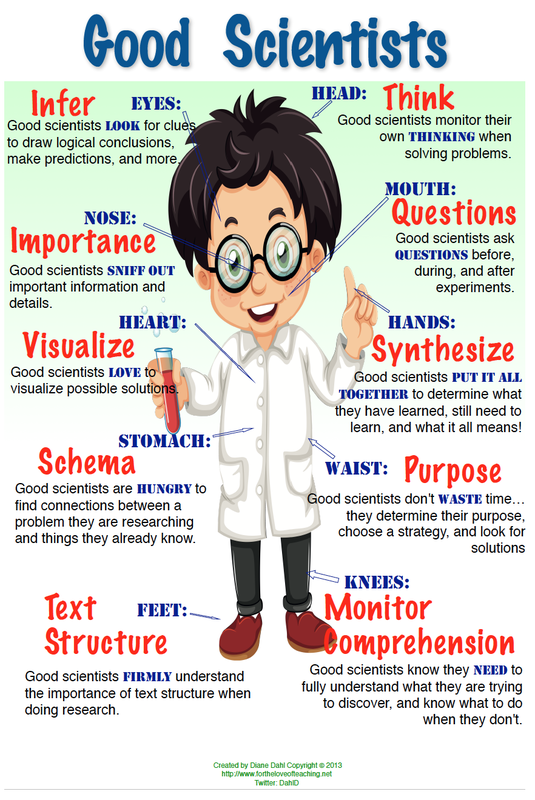 There are other options available, however I just wanted to cover the worksheet basics for now. 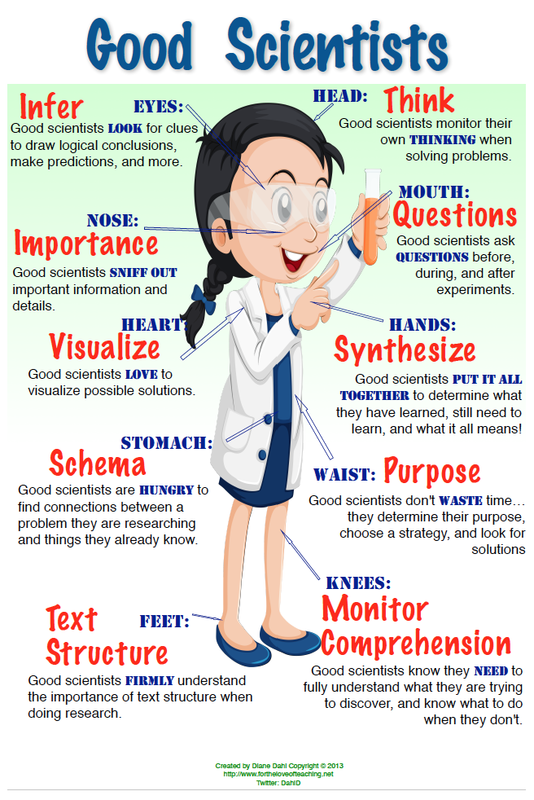 I hope this is will help you get started! 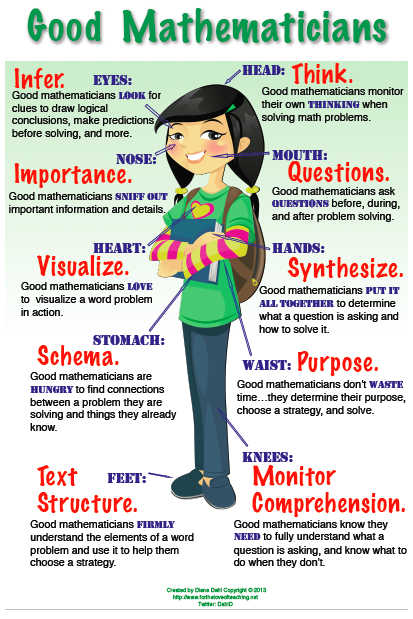 This is a very useful tool for math tutor like me. It's very efficient and easy to use. Thank you for sharing!